Opening Lines: Right smack in the heart of the Big City is a very special house. Synopsis: (from Amazon) Give that dog a puddle and he’d splash. Give him a whistle and he’d roll over. Give him a rule and he’d break it. One day a passel of puppies was born. Each puppy was designated for a Very Important Job, like Service Dog, or Search and Rescue Dog, or Groomed for the Show Ring Dog. Each puppy, that is, except Mogie. Mogie was a ball-chasing, tail-wagging, moon-howling pup. Not the kind of pup for any of those jobs! But there is a place that is just right for Mogie: a very special house where sick children and their families can stay while they undergo long-term treatment. A place with children who NEED a ball-chasing, tail-wagging, moon-howling pup. And there’s one little boy in particular who needs Mogie. And Mogie is about to prove he’s the best darn pooch in the passel. Based on a true story, this heart-warming picture book is published in conjunction with the Ronald McDonald House. Why I like this: Based on a true story it has that heart felt warm aww feeling about it. Mogie with his cheeky ways and cute little face is a special little dog with an inner special bond with sick kids. 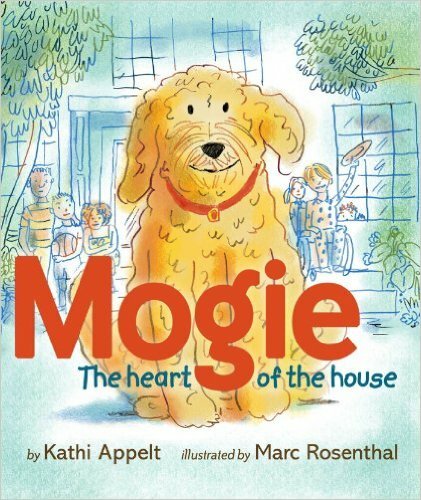 Like anyone who loves dogs you will fall in love with Mogie. The author felt extremely lucky to have met Mogie and she fell in love with him. He is a very special part of the Ronald McDonald mission and brings a ray of light, and healing to each child. I love the light coloured pencil, charcoal drawings positioned in different places on the pages throughout. Interesting that the story started with the boy (Cage’s) point of view and then shifts to Mogie’s. This story was a Washington’s Children’s Choice Award. This entry was posted in Children's literature, Picture Book Review and tagged children and dogs, Children's Picture book, childrens books, Kathi Appelt, Susanna Leonard Hill, The Ronald McDonald House. Bookmark the permalink. Love this message that there’s a role and place for everyone. Also I would love to switch the switch of POV’s in this picture book. What a sweet story, Diane! Thanks Joanna. Yes I was a little perplexed at the way this story started, but it certainly turns out to be a real heart grabber! I agree with Joanna, a book that passes on the message that everyone has a role and place is beyond important. Sounds like a book every classroom should share with children. I agree too, Leslie. A very important message! Glad you like this. Aww! Mogie looks like quite the compassionate fellow! Animals can help in so many ways – even heard about a midwestern retirement home that used a pen of farm animals to amuse and help the residents feel better. That’s amazing Julie – regarding the pen of animals. They give such a calming influence to our lives. Mogie is a cutie! I love this one; pets can be such AmAzInG therapy! Here! Here! Thank you for stopping by Barbara. What a great cover! Makes you want to read it! Animals give so much to so many people daily! This is a winner! They sure do, Pat. Mogie looks a real cutie. Thanks for stopping by Pat. Take care.